If Lanzarote is an amazing destination for mountain biking lovers, what can we say about the island that hasn’t already been said? It’s an internationally famous island because of all it has to offer its visitors. This is why it is necessary to remember that it’s the perfect location to come with family and friends. While some pedal the others can dedicate their time to pleasure and all myriad of possibilities available on the island. Below we offer a brief description of everything interesting to see. We surely have left many things out! For example, it’s worth mentioning here that there are a number of wineries which produce marvellous wines produced from the volcano fields and there are a number of small museums which explain thousands of details about the island and its history. The companions will always be able to be near the cyclists because the distances are not very long. We recommend that the companions rent a vehicle. We can help you get get unbeatable prices. There is the option of staying in the same locations as the cyclists (changing location each day) and there is the option of staying in the same location all the nights. You will be able to take and pick up the cyclists to and from the starting and finishing points of the stage each day. Apart from all the interesting places we recommend below, the island offers many more activities. We are also fully capable of organizing and hiring the activities for you. Following is a detailed list of the activities you can enjoy on the island. There are a number of restaurants offering a variety of excellent dishes. On the island you will always find a nice place to enjoy the Canarian cuisine. We can’t forget all the nightlife lovers. There is an active nightlife available in the capital, Arrecife and in the larger tourist areas such as Puerto del Carmen, Costa Teguise and Playa Blanca. Lanzarote is the most western island of the Canarian archipelago and the fourth in size (805km2) after Tenerife, Fuerteventura and Gran Canaria. It is located 125 kms from the African continent and its highest elevation is 670mts. It measures 70 kms in length and 30 km in width. It’s in the subtropical area of 29ºN and 13ºW. The island as well as the entire archipelago is originally volcanic and began to develop around 20 million years ago. The latest eruptions of importance took place between 1730 and 1736 and in 1824. These enlarged the size of the island substantially. There are 110 counted volcanoes. The landscape is marked by significant erosion due to it being volcanic in nature as well as the aridity. The island is quite close to the Sahara desert. 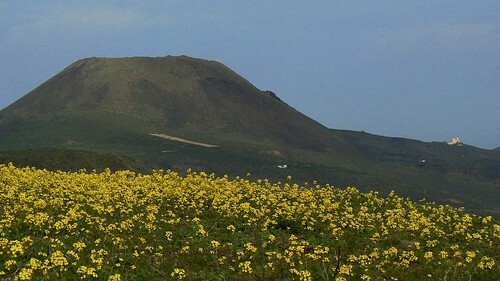 The other Canarian islands which are more easterly located have a higher elevation and thus receive more rainfall while Lanzarote with its low elevation hardly experiences rain. This also occurs in the nearby island of Fuerteventura. Both islands appear to be a prolonged desert. On the contrary to which it would seem due to the aridity of the island, the temperatures are mild and never very extreme. The average annual temperature is 20 degrees. This is due to the cold oceanic current which crosses the islands and the cool trade winds from the Northeast. The annual precipitation is that of a sub desert climate (140mm) and there are many hours of sunshine. The principal economic motor of the island is tourism, but until recently the subsistence agriculture and fishing were the way of life for the hardened inhabitants. -Cesar Manrique: Obviously this isn’t a “location of interest”, but given the significance for Lanzarote it is obligatory to make mention of this renowned artist, although superficially. He was born in Arrecife in 1919 and studied in the Superior School of Fine Arts of Madrid where he was clearly influenced by the surrealist styles of the 1950′s. He travelled and showed his work throughout the world and developed diverse art forms such as architecture, painting and sculpture. His most important work was achieved in architecture and his projects were done throughout the islands and Iberic Peninsula. However, his largest legacy stayed in his beloved island of Lanzarote. This not only includes the number of tourist centres, but rather what he was able to transmit to the Lanzarote people. This being the need to preserve the beauty of the island, the original architecture and to love and respect nature. When people visit Lanzarote and they see how clean and tidy everything is they should know that this is partly due to Cesar Manrique. Unfortunately, he died a sudden death in an accident in 1992 as he was leaving his foundation in Tahiche. -Arrecife: Capital of the island since 1852 and capital of the municipality of 60,000 people. The most interesting area to visit is the seaside. You will find the area of Cabildo where there are several pleasant and green areas to enjoy. The Gran Hotel is the tallest building on the island and is located next to the Reducto beach. Crossing the bridge of the Bolas you will arrive to the Saint Gabriel castle dating from the XVI century. In front of the bridge the Leon y Castillo street begins. It is the pedestrian and commercial area of the city. A bit further towards the interior we will find the Saint Ginés church square and the pool with the same name (marine pool with a narrow connection to the sea). Leaving the city, halfway into the port area, we will find the Saint José Castle from the XVIII century with its restaurant and contemporary art museum. -Arrieta: Fishing village located at the northeast of the island with great restaurants and with a small but pleasant beach. -Caleta de Famara: Small fishing village on the beach of Caleta de Famara. 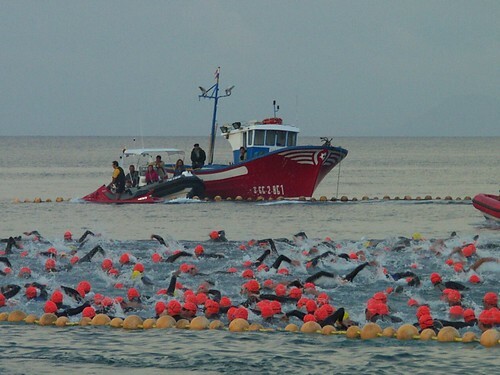 The bay is more than 6 km long and is a surfing paradise. You can rent surf boards and receive surfing classes. Be very careful with the current and waves. It is a relaxed village much appreciated by those who live on the island. At the foot of the imposing Famara cliffs one may also undergo mystic transformation, become a “neo-hippy” or both! There are excellent restaurants where visitors can enjoy the local cuisine. -Coloradas Castle (XVIII century): Near the Playa Blanca at the south of the island. It placed a defensive role against the pirates of the era which in many cases were Moors. 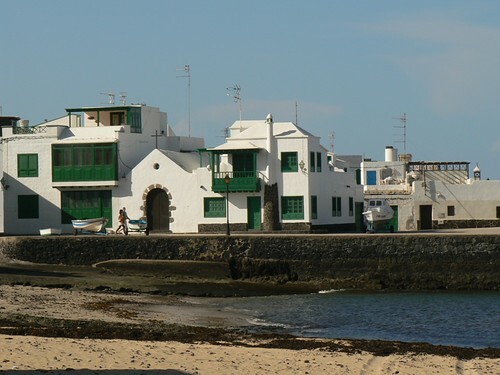 -San José Castle (XVIII century): In the harbour area of Arrecife. Holds a restaurant and a Museum of Contemporary Art. -Charco del Palo: Nudist urbanization on the coast between Guatiza and Mala. The Charco is principally visited by Germans who own numerous properties in the area. Rocky bays prepared for pleasant swimming and sunbathing. Be watchful of the sea conditions. It’s a great area for scuba diving. -Costa Teguise: One of the 3 most important tourist centres of Lanzarote with all of the services that these centres usually offer. 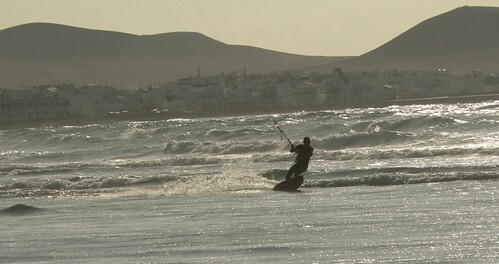 It is located to the north of Arrecife and its beach, Cucharas, is one of the best locations in the world for windsurfing. A number of companies rent material and give classes. -Cueva de los Verdes: A cave prepared to allow an up close visit to the Jameo del Agua. In fact, it forms part of the same volcanic tube system. A subterranean route of approximately 1 kilometer can be done inside this magnificent example of volcanic caves. Thanks to the placement of a lighting system we can enjoy its colours and beautiful formations. There is a large interior cave which is used periodically as an auditorium given its exceptional sound qualities. An historical curiosity is that the cave served as a refuge when pirates attacked the island. -El Golfo (charco verde): To the south of Timanfaya you will find another peculiar and immensely beautiful slice of nature. A volcanic caldera from the eruption of 1824 has been rapidly eroded by the ocean. As a result only a part of the crater remaining is the part which hasn’t been reached by the sea yet. Its walls are covered by spectacular shapes and there is a black sand beach beaten regularly by the furious waves. At the foot of the wall of the crater there is a pond of green water which gives it its name of Charco Verde (green pond). The green colour of the water is a product of an algae which lives in it. 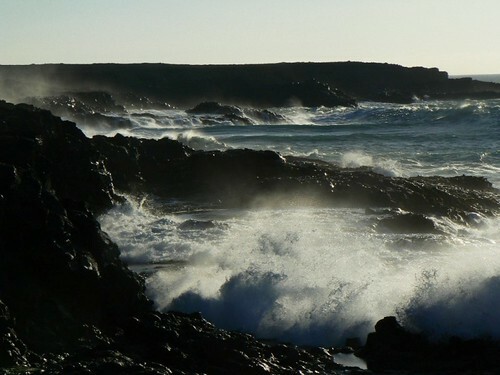 Adjacent to this natural wonder is the small fishing village called El Golfo. It’s one of the best spots on the island for eating seafood and enjoying incredible sunsets. -Las Nieves Chapel (ermita): Its origins date to prior to the XVI century and it is located near the highest point of the island. 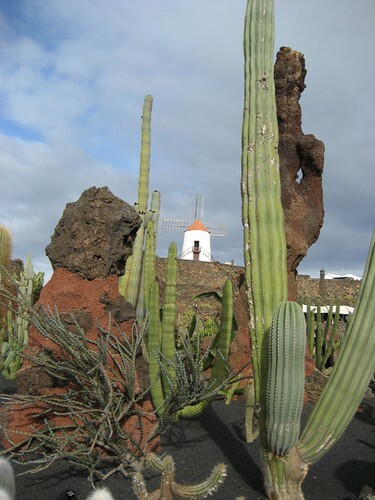 The chapel is a clear example of the Lanzarote religious architecture. It owes its origin to the appearance of the Virgin to a young shepherd. -Cesar Manrique Foundation: Located in the village of Tahiche. The house was designed by Cesar Manrique. He lived in the house from 1968 until his 1988 and in 1992 became the headquarters for the foundation which is named after him. In addition, the house has a small museum with his art work and personal collection. The house is built over 5 volcanic bubbles from the 1730 eruption. These bubbles are interconnected and communicate with the upper spaces which, following traditional architecture is made up of larger rooms and huge windows with views of the volcano. The gardens and the pool area are totally integrated in the landscape. The Foundation is a very interesting place to visit to admire and understand the ingenuity behind this connection between art, architecture and nature. -Guatiza: Picturesque village of the north of the island. The tourist centre, Jardin de Cactus (see description below), is within this village. You will see that the area is full of cactus fields. It has to do with a small insect that lives in the cactus which is similar to a wood louse and which was used in the past to produce colourings, principally red. It is gathered with a type of spoon which is quite a laborious process. Nowadays, thanks to the recovery of traditional techniques, the activity is being re-born. If you are fond of strawberry yogurt or if you use red carmine or lipstick….you know where to go! -Guinate: A small village nestled in the heights of the Famara Cliffs. It has a spectacular lookout over the region and if you like animals, it is home to an exotic bird park. -Haría: Haría is the capital of the municipality. It is one of the most beautiful villages of the island. It is located between mountains and is home to a number of examples of Canarian architecture. It is also called the village of 1000 palm trees given that the entire valley is full of them. In fact, it holds the densest population of palm trees on the island. It was the last residence of the world famous Lanzarote artist, Cesar Manrique. -Jameos del Agua: This is a tourist centre designed by Cesar Manrique and a obligatory stop on the island. A series of volcanic tubes or caves have been adapted and conditioned to create an authentic piece of art. We will enter by some steps which take us to the end of an enormous hole created by the sinking of the ceiling of the volcanic tube. From here we can follow along the edge of the subterranean pool of salt water (it goes up and down with the tides) until we reach an open area where there is a dreamlike garden and pool (swimming is not permitted). An enormous cave has been conditioned as an auditorium and many events are held there. In the upper area of this natural marvel some buildings have been constructed which hold the Museum of Volcanology. There is a bar and restaurant. One of the noteworthy features of this location is the existence in the underground pool of miniscule and rampant white crabs which have become a symbol of the island. They are visible from the edge of the pool. -Cactus Garden: Tourist centre designed by Cesar Manrique in the village of Guatiza. 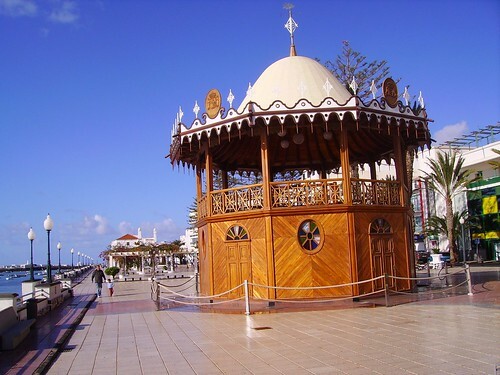 Inaugurated in 1989 it is a tribute to the area which is dedicated to the wood louse industry (See Guatiza). Taking advantage of an old quarry various beautiful gardens which are home to over 10,000 plants and 1,400 different species have been created for the visitor’s pleasure. -La Geria: Protected landscape with more than 5000 hectares. 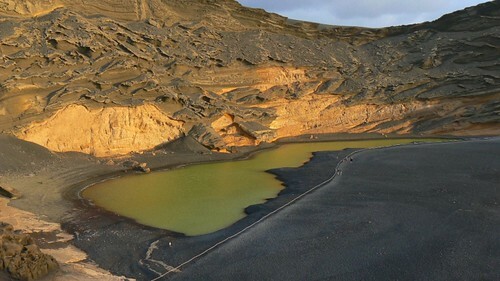 Located in the centre of the island and near Timanfaya this space has been transformed by man. 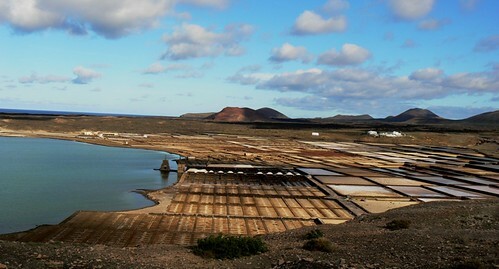 The agriculture of Lanzarote has always suffered due to the lack of rainfall. The ingenuity of man has managed to alleviate this problem. The volcanic ashes have the property of absorbing the night humidity without allowing the moisture to escape during the heat of the day. For centuries, the farmers have brought fertile soil to this area, covered it with volcanic ashes and then surrounded every plant with a small rock wall to protect it from the wind. This immense effort has created a lunar landscape which is quite unique in the world. Thousands of these holes help the vines grow. They are then often used to make the magnificent broths of Lanzarote. -La Graciosa: The largest island of the Chinijo Archipelago Natural Park, a marine reserve with an area of more than 70,000 hectares. This archipelago is made up of La Graciosa, Alegranza, Montaña Clara, Roque del Este and Roque del Oeste. 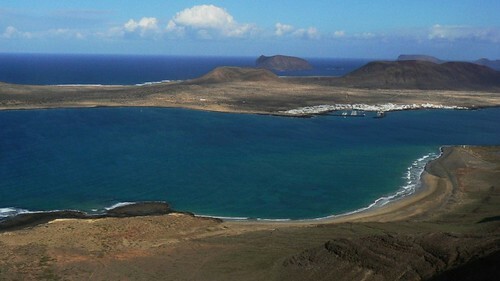 The only inhabited island is La Graciosa with the it’s capital and only populated area being the Caleta de Sebo. It is home to nearly 1000 people. There is another small village, Pedro Barba which is only inhabited in the holiday season and on the weekends. The island is quite small. It is 10 km in length and 4 km in width. There are various volcanic cones with a maximum height of 260 meters. There is no asphalt, there are few vehicles and the streets of Caleta de Sebo are covered with sand. The landscape is extremely arid and the dryness rules the sandy fields creating a magical and desolate atmosphere. The beaches are completely virgin and the sand is very white. The beaches towards the south and the southeast are better for swimming. It is a paradise for scuba divers and those seeking peace and quiet. In Caleta de Sebo there are all kinds of tourist services and several restaurants where you can savour some of the best fish of the Canarian Islands. In summary, La Graciosa is a paradise which doesn’t exist anymore in the world and certainly in crammed Europe. -La Santa: Small marine port on the west coast. It is famous for having one of the best waves in the world for surfing. This wave is for experts only as the sea bed is volcanic and the waves are generally very large. In addition, the local surfers don’t tend to be very hospitable when it comes to sharing their good waves. -La Santa Sport: A tourist area of the capital with a large Danish population specializing in vacations for people interested in sports. Next to the village of La Santa, it has sport facilities of all type and of a high standard. Some of which can be used paying an entrance fee. -The Janubio Salt Mines: Spectacular salt mines that at one time were the principal economic motor of the island. Nowadays the mines are being recovered and currently produce salt on a small scale. The lagoon and nearby beaches are perfect locations for marine bird observation. The beach is very nice but also quite dangerous. -Los Ajaches: Mountain range of 600 meters in elevation at the southeast of the island. In addition to the Famara cliffs they are the oldest areas of the island being between 12 and 17 million years old. Its extreme aridity, the number of ravines, its landscape and its isolation make one think of the nearby Sahara desert. Los Ajaches are a Natural Monument. -Los Hervideros: This is a volcanic cliff area near the Golfo where the sea usually hits the land with force. The area has been conditioned for visitors. The ocean has carved out caves and chimneys creating a spectacular sight for the spectator. No one leaves Los Hervidores unaffected. 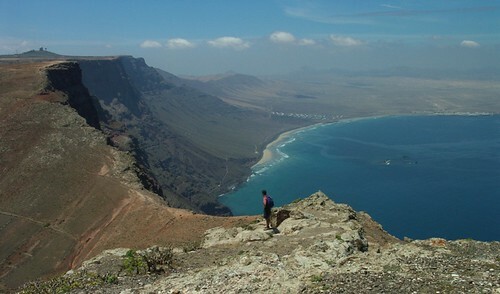 -Mirador del Rio: This is a lookout spot on the Famara cliffs with views of the island, La Graciosa. Designed by Cesar Manrique and finished in 1979. The bunkers from the war between Cuba and the USA were used as part of the imaginative architectural design by the Lanzarote artist. The exterior is quite a delight and the interior is also quite interesting. It is worth the visit. The hanging balcony is amazing. The entrance includes a drink at the bar. -Monument to the Peasant: Monument to fertility designed by Cesar Manrique in the geographic centre of the island. The monument is a white structure 15 meters tall formed by old water tanks from fishing boats. There is also a museum where you can see the traditional way of life of the country folk who still live in the area as well as various local craftsmen and women. There is a restaurant and gift shop. -Orzola: Fishing port to the north of the island with maritime bridge to the nearby island, La Graciosa. Its coast is full of reefs which create beautiful Turkish blue colored lagoons. It is incredible to see how the Famara cliffs stretch out, impossibly separating the Atlantic in two. 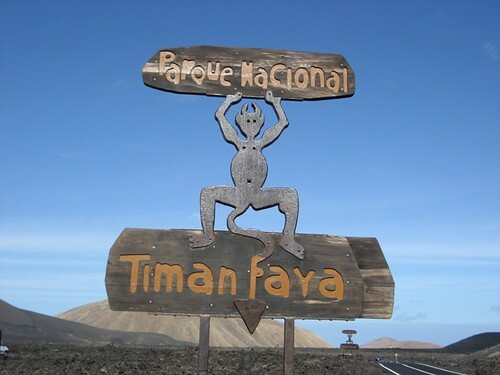 -Timanfaya National Park: A singular place in the world. 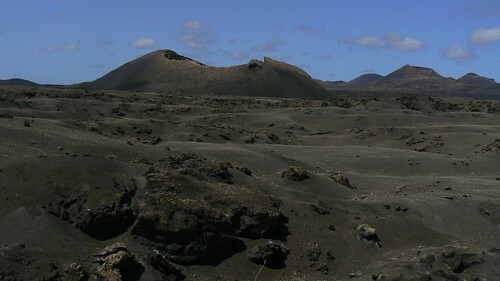 The recent volcanic eruptions from 1730 to 1736 and in 1824 left a surface area of more than 5000 hectares covered by lava fields where vegetation has hardly been able to grow. In this immense space you can see all types of volcanic representations from the gigantic craters such as the “little heart” 400 meters in diameter and more than 100 meters deep to the impossible multi-colored volcanic ash fields. Difficult land forms made by quickly cooling lava as well as masses formed by lava cooling slowly can be observed. There are small chimneys, volcanic tubes which serve as a escape for gases and a large number of tormented forms to observe. There are several ways to visit the park. The most common is paying the entrance fee and visiting the area on the tourist buses. The tour route is 14 kms long and goes through some amazing areas. In the Islote del Hilario, where you will start the tour, there is a restaurant with a grill where they cook the food simply with the natural heat of the volcano. You can also see how when water is poured on the land it is rejected and sent to the air in the form of vapour and how dry branches burn when they come in contact with the earth. A second way to visit the park is requesting a guided walking tour at the nearby Casa de los Volcanoes in Mancha Blanca. They offer a variety of amazing excursions which can not be done without a guide. There is an interesting volcano museum as well. On the highway going down towards Yaiza you will find a location where you can go on a short camel (dromedary) ride and then erase it from the “things to do in this life” list. The Dromedaries were used until recent times in the agriculture of the zone given the lack of water. -Playa Blanca (white beach): One of the three most important tourist centres of the Lanzarote. The Playa Blanca offers all the services you would need on vacation. It is on the southern end of the island and has undergone significant urban sprawl in recent years. The port for the ferries to cross over to Fuerteventura is located here. It is half an hour by boat. There is pedestrian walkway at the edge of the sea longer than 8 kilometers. It is a delight from walking, running or cycling. It is usually sunnier than the rest of the island and is quite near the paradise like beaches of Papagayo. Playa Blanca is also an ideal location to scuba dive. A sports complex, Rubicón, has recently been built. It is quite nice for a stroll, to have drink or for dining in one of its restaurants. -Famara Beach: Giant beach at the foot of the spectacular Famara cliffs. This beach is particularly coveted by the people of Lanzarote. It is facing the northern sea which means it has strong currents and big waves. 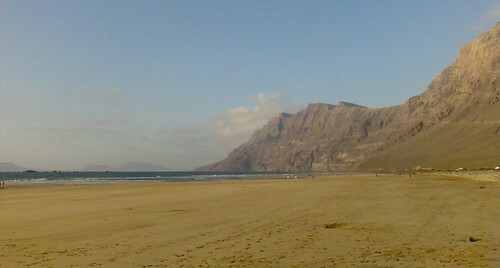 You can rent surf boards in the nearby Caleta de Famara. Careful! It can be a windy location and at high tide the beach can even disappear. A stroll at sunset with low tide when the giant beach is empty and bare and without much will certainly register as an unforgettable experience. -Playa Quemada (burnt beach): Small and peaceful fishing village on the outskirts of the Ajaches. It has quite a peculiar beach which has accumulated an enormous mountain of sand (black sand, by the way). There are a couple of restaurants. -Papagayo Beaches: On the south-eastern point of Lanzarote we will find a series of white sand beaches whose waters are almost always calm and Turkish blue in colour. They will make us forget about Caribbean and Polynesian destinations. Why go so far if these are as beautiful (if not more!)? You can arrive to these beaches by boat from Playa Blanca or by car paying a small fee per vehicle at the entrance of this protected area. -Puerto Calero: A luxury Port located between the Puerto del Carman and the Playa Quemada. It is nice place for a stroll, to have a drink or to dine in one of its many restaurants. 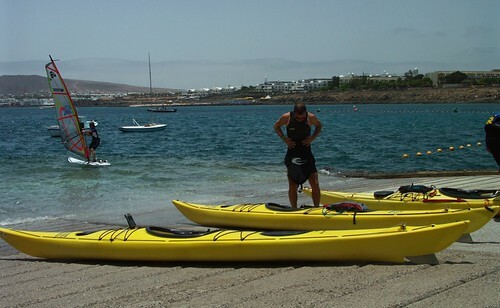 -Puerto del Carmen: The most important tourist centre of Lanzarote offering a large variety of service. It is located on the eastern coast and is very near the airport. It has a number of excellent beaches and is the ideal location for scuba diving. A golf course has recently been built here. -Punta Mujeres: A small fishing village on the north-eastern coast. Its narrow streets and marine pools make it an attractive stop. The village has some nice restaurants and bars with typical dishes. -Famara Cliffs: Mountain range and culminating point of Lanzarote nearly 700 meters in altitude located at the northeast of the island. In addition to the Ajaches Massif they are the oldest areas of the island being between 12 and 17 million years old. The western side that faces the ocean is a giant set of cliffs reaching up to 500 meters high and almost 20 kilometres long. The cliffs are home to thousands of marine birds. The cliff’s best attraction is a place called “Peñas del Chache”, but they can’t be accessed given that there are military facilities. 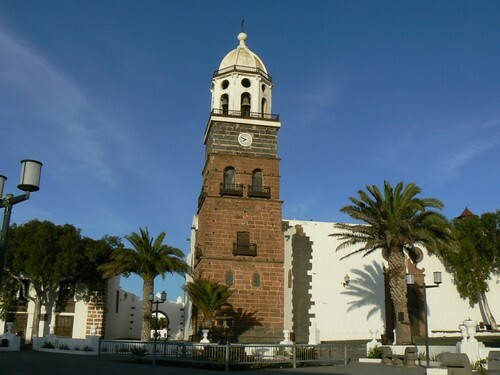 -Teguise: Capital of the island since 1852 and capital of its municipality as well. Teguise is home to marvellous colonial architecture on the central northern plateau of Lanzarote. Making mention of all the interesting buildings would require a separate book; therefore, it is recommended that you get lost strolling through its quaint and well conserved streets which rank high in a “top ten” list of Spanish streets for a gingerly stroll. Its peaceful streets have a number of nice cafés and restaurants as well as a number of local crafts shops. Sunday mornings the calmness disappears as all the tourists of the island converge on its street market (the most famous one in all the Canarian islands). -Yaiza: Capital of its municipality and village known throughout the island for its beauty. A note of interest is that the lava from the eruptions which occurred between 1730 and 1736 just reached the edge of the village without entering. In gratitude, a chapel was built in the nearby lands of Geria.